At the six-month point of Barack Obama’s term last week, bloggers considered how he was doing. That discussion was driven largely by conservatives who relished in what they saw as Obama struggling politically, perhaps for the first time in his presidency. From July 20-24, more than a third of the links in blogs (36%) were to stories about Obama’s administration, according to the New Media Index by the Pew Research Center’s Project for Excellence in Journalism. The majority of those links focused on new survey results from the Washington Post/ABC News and USA Today/Gallup that showed Obama’s approval ratings slipping in recent weeks. Many conservatives argued these were the sign of a failing President. The recent drop in support for Obama’s handling of the economy and health care has received attention in the mainstream press as well, though largely in connection broader coverage of those issues. What distinguished social media last week was that the poll numbers were often the catalyst for the conversations that ensued. The second-largest story in the blogosphere last week was far removed from American politics. A BBC report (which received 14% of the links) revealed the new costume for British TV science fiction character Dr. Who. That was followed by a report on a fight over library books in West Bend, Wisconsin (11%) that cost board members their jobs and led to demands for a public book burning. The fourth most linked-to news story in social media intertwined the thorny issues of politics and race. The arrest of Harvard Professor Henry Louis Gates and the subsequent controversy fueled by remarks from Obama received 8% of the week’s links. The Gates arrest also generated significant attention in the mainstream media last week, coming in No. 3 (at 12% of the newshole), according to PEJ’s News Coverage Index. 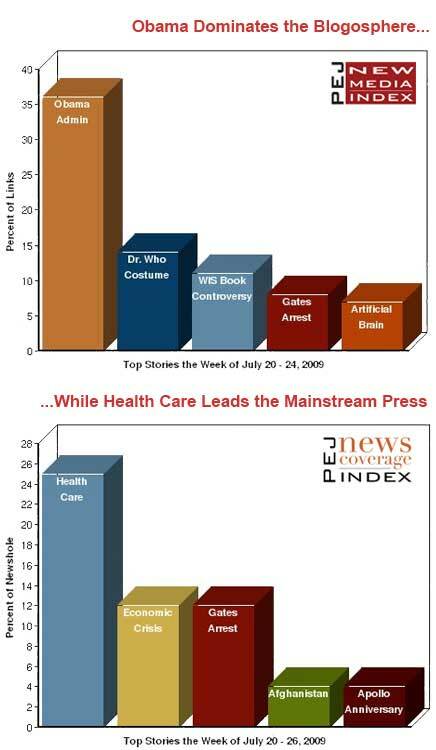 The top two stories there were the debate over health care reform (25%) followed by the economic crisis (12%). The New Media Index also monitors the most-linked-to news stories on Twitter as measured by the tracking service Tweetmeme. And on Twitter, the protests in Iran topped the list for the sixth straight week. 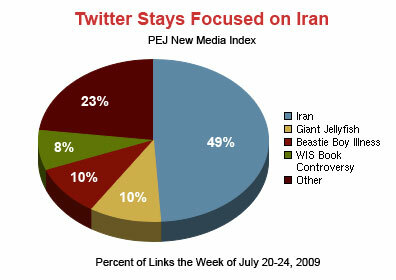 Almost half, 49%, of the news links from tweets were about new developments concerning the internal and political unrest in Iran. That was about five times bigger than the No. 2 Twitter topic, a CNN story about Japanese fishermen confronting giant jellyfish that can grow to 6 feet in diameter and weigh up to 450 pounds. On Monday, July 20, the Washington Post’s latest survey found that while Obama’s overall job approval rating remained at 59%, ratings for his handling of specific issues-particularly health care-had slipped below the 50% mark. The following day, USA Today released its survey showing Americans were becoming more pessimistic about the economy and less confident in Obama’s programs. This report came on the heels of USA Today’s interactive chart of presidential approval ratings going back more than 60 years which had Obama ranked 10th out of 12 at this point in his presidency. For the traditional press, these poll numbers were a frequent topic of conversation, but were often incorporated into stories that focused on specific issues such as health care or the economy. For example, during the July 20 edition of Fox News’ daytime show Live Desk, anchor Trace Gallagher introduced a segment about the health care reform by saying, "President Obama calling the need for health care reform urgent and indisputable, saying we have talked about this problem to death year after year and the time to act is now…but recent polls show the President’s approval rating on this issue is not just slipping, it’s dropping." In the blogosphere, the poll numbers themselves were generally the focus of the conversation. And according to many, they spelled terrible news for Obama. "The thrill is gone," proclaimed Jerry Fuhrman at From on High. "Maybe Obama should try something else. Like giving up on the socialism thing." "Republicans need to keep hammering away at Obama," suggested Scott Miller at The Conservative Post. "Start calling his radical agenda what it is, and explaining to voters how the conservative, common sense, free market solutions that Republicans represent will be the right solutions to our nations problems. Do that, and Republicans will be back in the majority in both chambers in 2010 at this rate." While liberal bloggers generally stayed on the sidelines of this conversation, some did argue for putting the poll results in perspective. Matthew Yglesias posted a chart showing that Obama’s approval ratings were still 12 points higher than Congressional Democrats and 23 points higher than Congressional Republicans. "If I’m in White House Legislative Affairs and I’m talking to a nervous member of congress, I’m showing them that chart and arguing that the progressive president is more popular than the somewhat dawdling congressional Democrats and way more popular than the obstructionist Republicans," he stated. Other bloggers felt all the hype over these poll numbers was somewhat overstated. "The Democrats could find themselves in a better position after the August recess or they could find themselves in a worse one-how’s that for a bold prediction!" wrote Nate Silver at fivethirtyeight.com. "But liberals’ doom-and-gloom, conservatives’ glee, and the media’s nearsighted reporting are all equally uncalled for." The one story that received considerable attention in both the blogosphere and in the traditional media last week was the arrest of prominent black scholar Henry Louis Gates Jr. in his Cambridge home. And in both the mainstream and social media, the President himself fueled the story after he stated that police had "acted stupidly" in the case during a July 22 press conference, ostensibly called to discuss health care. Some bloggers criticized Obama for making an ill-informed statement. "He [Obama] can say beyond a shadow of a doubt that police in Cambridge, Massachusetts, ‘acted stupidly’ in arresting a man after a confrontation at the man’s home," wrote Bob G. at Sweet Spirits of America. "How can he do that? Easy, the man was black so of course the white cop is at fault. Who’s the racist now? Obviously our president is doing his own profiling, but the media doesn’t seem to mind." "I’m not completely sure if this was a open and close case on racial profiling, but I know that a situation such as this could have been avoided by deescalating the situation and communication. Or at least that’s what I like to think in my head," declared The World According to M.I.S.S. "I just know that if this type of racial and economic profiling can happen to a prominent figure in our society like Skip Gates, then it can happen to any one of us." Still others saw the situation as what Obama himself called it, "a teachable moment." "In order to achieve the laudable goal of becoming a post-racial nation we still have much work to do," asserted author Thomas N. DeWolf on Beacon Broadside after focusing on the incident. "That work includes…learning more about what we don’t know. More than at any other time in history, events have conspired to allow us to more freely and readily learn and talk about race in America; to expand the circle of who and what we know." Last week’s top news videos on YouTube were an eclectic mix. The most-viewed video was a report from Britain’s ITN News about British soccer star David Beckham’s return to play in the United States with the Los Angeles Galaxy. A number of fans at a Galaxy game booed Beckham because they felt he had not demonstrated enough commitment to the team due to his playing obligations with teams in Europe. The scene turned ugly when Beckham apparently confronted several of the most outspoken critics. At half-time, Beckham went over to a section of the crowd and appeared to engage in an argument with spectators. The ITN report included several interviews with fans who claimed Beckham had acted inappropriately. "He’s the player. He’s the professional. He should have kept himself under control and he didn’t," insisted one angry fan. 1. A report from ITN News about British soccer star David Beckham’s confrontation with fans in Los Angeles. 2. A video of Bowe R. Bergdahl, the U.S. soldier captured by the Taliban in Afghanistan. 3. The Young Turks, a radio and online talk show, discuss the scandal involving an online peephole video of ESPN reporter Erin Andrews. 4. Senator Barbara Boxer (D-CA) is accused of playing race politics by Black Chamber of Commerce President Harry Alford during a July 17 committee hearing. 5. A July 16 interview on MSNBC’s Rachel Maddow Show where Pat Buchanan says that the U.S. was "built basically by white folks." PEJ’s New Media Index of blogs typically utilizes data collected from two different Web tracking sites, Icerocket and Technorati. This past week, Technorati had technical problems so the blog figures for this week’s NMI are based solely on daily figures from Icerocket.